Q: Dr. Konynenbelt, why did you decide to pursue the Pediatric and Vision Therapy residency at SCO? For me, the decision to come to SCO was easy. The art of vision therapy is that there are often multiple approaches one can take to solve the same problem. Coming to SCO, I was confident that I would be exposed to a diverse set of excellent VT doctors offering their own views on how to improve vision through vision therapy. I am now able to take the comprehensive model of vision that I have developed and apply it to my future VT endeavors. Q: What were some of the opportunities or strengths presented by the Pediatric and Vision Therapy program? One strength of the program is that the school has a dedicated vision therapy department that operates with therapy and evaluations occurring simultaneously. The residents are immersed into the VT world in a way that permits them to see the process from start to finish. Some great opportunities unique to this residency include the many external relationships that SCO has. In the same week, residents may treat children on the MobilEyes unit, evaluate division I athletes at the university, and offer hospital based care to elderly patients at one of the local rehabilitation centers. The program clearly demonstrates that patients of all ages can benefit from vision therapy! Q: What sort of support structure did you find from the faculty and staff? One great benefit of being a resident in an academic setting is that all of the doctors you work with have chosen a career dedicated to educating and advancing young professionals. As an example, one of the doctors is intentional about having the residents over for dinner at least once a month. At these dinners, we are free to pick his brain on anything optometry related. This atmosphere allows for active discussion and a deeper understanding of what we do on a daily basis. Q: What advice would you give a fourth-year optometry student debating whether or not to choose to do a residency? My best piece of advice is to choose the path that will best equip you to do what you love. Most residency programs will be a lot of work, but it truly is a rewarding experience. Optometry school prepares you well to enter the field of vision care, but a residency program will set you apart and allow you to practice at a higher level. Q: Now that you’ve completed the program, what was the best thing about your residency? The best thing about my residency was the flexibility of the program. In addition to publicized experience, I had the opportunity to observe the doctor performing electro-diagnostics and collaborate with the contact lens resident. These experiences have expanded my scope of practice beyond that of most traditional residency programs. Q: Dr. Idoni, why did you decide to pursue the Pediatric and Vision Therapy residency at SCO? SCO’s high quality of faculty instruction and unique opportunity for exposure to a more behavioral treatment approach made the choice to pursue the residency very simple. The program at SCO provided flexibility to tailor it to fit my goals and I knew I would have the opportunity to professionally grow in all areas that were important to me. Each day of the week provided a completely different experience. This diversity pushed me out of my comfort zone and taught me both clinical and personal skills that enabled me to become the best doctor I can be. There was not a moment when SCO’s faculty and staff were not there to help me in every way possible. The atmosphere at the college was always inviting and comfortable. No regrets; just do it. It will far exceed your expectations. The benefits are well worth any sacrifices made during the residency year. The clinical experience I enjoyed most during the residency program was the external vision therapy site, in which we had the opportunity to work with children on the autism spectrum. Working with the special needs population is one of my favorite aspects of optometric care, and one in which I did not have much experience prior to residency. Q: Dr. Weigel, why did you decide to pursue the Pediatric and Vision Therapy residency at SCO? I chose to pursue the Pediatric and Vision Therapy residency at SCO because I felt very comfortable with the school after visiting and interviewing at the school. The faculty were very welcoming during the interview process. The program itself appeared excellent and would allow me many opportunities to see many different types of pediatric and vision therapy patients not only at SCO, but around Memphis at the schools with a partnership with a local mobile vision unit. A great thing about the residency program was the freedom to take continuing education classes and attend meetings to further my vision therapy knowledge base. I was able to meet and learn from many different leaders in the field. The biggest strength of the Pediatric and Vision Therapy program is the chance to work with such a great diverse group of pediatric and vision therapy faculty members. The faculty have worked in pediatric hospitals, primary care practices, VT only private practices, and/or academic settings and each brings their own unique strengths. I was always comfortable approaching any faculty member with any question I ever had involving any patient or topic I wanted to discuss. The faculty are always pushing me to expand my knowledge base and my comfort zone. Each faculty member has his/her own philosophy and was willing to discuss it with me at any time. This has allowed me to develop my own ideas by incorporating their ideas about exam sequence, treatment options, VT, etc. The support from faculty and staff was excellent. Whether it was needing to reschedule a patient for a follow-up exam, schedule time off for meetings, or needing to refer patients to other professionals, the faculty and staff was always able to help. The biggest thing is to know your own comfort level as you are finishing your fourth year. I knew that I wanted to specialize in Pediatrics and Vision Therapy, but I was not 100% comfortable with programming and instituting my own vision therapy programs for my patients. I chose to do a Peds/VT residency to gain the knowledge about vision therapy to be confident in my future practice. It is very hard to pick the one best thing about my residency. I had a great experience during my residency year. The best thing had to be the ability to learn from all the faculty here at SCO. I am glad I picked SCO and I would not trade the opportunity to learn from the SCO faculty for anything. Q: Dr. Kehbein, why did you decide to pursue the Pediatric Optometry residency at SCO? I knew I wanted to pursue pediatric optometry from the time that I started optometry school. Pediatric eye care is an important and expanding field within optometry, and I wanted further training in this field through a residency program. SCO has an excellent program, strengthened by the diversity of the faculty and the variety of clinical opportunities offered to the resident. Q: What were some of the opportunities or strengths presented by the Pediatric optometry program? I am impressed by the flexibility of the program. The resident has the ability to work in a variety of different settings, including pediatric exams, school vision screenings, and vision therapy. The faculty at SCO has many years of experience in the various areas of pediatric, behavioral, and developmental optometry. They encourage the resident to gain a thorough understanding of these areas while also allowing the resident to explore his or her areas of interest. I would recommend that the student explore residency options. A residency is a great way to further expand a clinician’s knowledge in a specific subject area, even if future plans include primary care optometry. Q: What aspect of the residency are you most looking forward to? I’m looking forward to expanding my vision therapy knowledge. I hope to gain further experience working with patients with binocular vision disorders as well as those with learning related vision problems. Additionally, I hope to learn which therapy techniques are most successful and can be applied to private practice optometry. Q: Dr. Reddell, why did you decide to pursue the Pediatric Optometry residency at SCO? I was first exposed to optometry as a teenager when a pediatric optometrist treated my younger brother for accommodative esotropia. Since then, pediatrics has always been my area of interest and an easy decision in terms of type of residency. During my time as a student at SCO, I felt that the pediatrics faculty was very passionate & knowledgeable. They were always willing to go the extra mile to answer my questions and encourage my development as a pediatric optometrist. The greatest strength of the pediatric optometry program at SCO is the diverse background of the pediatrics faculty. The doctors come from many different generations of graduates and educational/clinical backgrounds. This allows for exposure to different treatment & management philosophies and a more well-rounded educational/clinical experience. 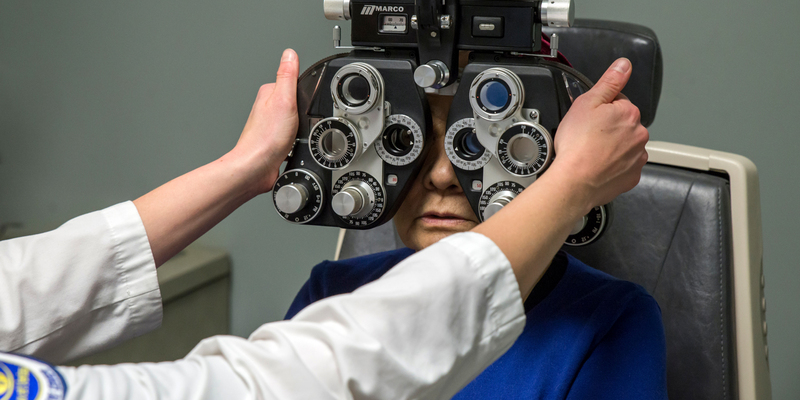 Another benefit to practicing at SCO is that the Memphis population provides a wide range of types of patient encounters, including both ocular disease and binocular vision issues. It is important to determine your own reasons for wanting to complete a residency by doing your homework. Review the ORMS website and research the programs you are interested in. It is imperative that you talk to current residents (especially those at the programs you are interested in), ask why they chose their residency and what they plan to do with their training after completion of the program. This can help you determine if residency is for you and which programs provide what you are looking for. I am looking forward to developing my own treatment philosophies with the guidance of highly-trained staff doctors. I am excited to expand my skills in ALL areas of pediatric management including ocular disease, binocular vision, vision therapy & learning related vision disorders. Additionally, I look forward to working with optometry students. Q: Dr. Russell, why did you decide to pursue the Pediatric Optometry residency at SCO? I wanted to do the residency at SCO to advance my clinical experience in pediatric examinations and vision therapy. At SCO there are a lot of highly experienced doctors whom have worked with children for over 40 years, and all of their knowledge would be at my disposal to enhance my clinical skills. I also wanted to expand my knowledge in Behavioral Optometry, which unfortunately I didn't get much exposure to in my optometric education. Additionally, coming to Memphis I would get the opportunity to work with a different patient population versus where I attained my training, Ft. Lauderdale, Florida. The strengths presented by the program were the experiences I would achieve in developmental and behavioral aspects of optometry, more exposure to amblyopia and strabismus, management of binocular vision disorders, and the ability to work with these types of cases in vision therapy. In addition, you get to have your very own room in clinic to perform pediatric comprehensive exams. I also like the fact that your schedule is flexible to meet all areas you are interested. For example, if you wanted to teach more to the students, do more days in vision therapy, assist in the binocular labs, vision screenings, observe with other professionals (Pediatric Ophthalmologist, Occupational Therapist, Reading Specialist, Audiologist) the residency supervisor will make it happen. There is also a day set aside where you can go over any difficult cases you have seen and get verbal input from any of the staff doctors to see how they would have worked up the case. A residency is an opportunity to get many years of experience in one year. It allows you to learn from doctors that have a good understanding in many aspects of pediatric optometry. It also opens the door to many job opportunities because you have specialized in this field of Optometry. The last four years of your Optometric Education you were learning the fundamentals now it's time to get real clinical experience and learn things you didn't at school. Learning a lot about Behavioral Optometry and how to apply it in a private practice. Seeing different therapy techniques to do with the children. Further developing my communication skills and clinical skills to be a successful private practitioner. Q: Dr. Sands, why did you decide to pursue the Pediatric Optometry residency at SCO? I initially pursued the pediatric residency at SCO because I was interested in teaching at the college. I had always been interested in pediatric vision so for me it was a good fit. The pediatric faculty seemed very knowledgeable and easy to interact with while I was in school. The pediatric residency provided me the opportunity to interact with a wide range of faculty members. The faculty consists of individuals from many different eras so there are many different thoughts on both exam sequences and appropriate treatment modalities. Also the population in Memphis provides a wide range of eye related problems for the resident to encounter. This year I have dealt with everything from possible retinoblastomas to severe developmental problems. The faculty and staff have both treated me with the utmost respect this year. The staff tries to help aide in the learning experience in any way they can. The faculty shares their knowledge freely and will go out of their way to help you in any way that they can. They are more than happy to provide second opinions, answer case related questions, or guide you to articles that deal with any questions you may have. I would recommend that the student take the time to determine why they want to do a residency, search the ORMS website to find programs that fit their desires, and then make sure to interview at each site that they think may fit their criteria. In the end the student must have a desire to learn and strong work ethic, but the rewards greatly outweigh any sacrifices that must be made over that year's time. By far the best thing I gained from my time as a resident has been the comfort level I have obtained with handling difficult cases. When I started I was at times intimidated by patients that had interesting findings or were difficult to examine. Now there are very few findings during an exam that put me on edge. I have gained confidence in my objective findings and no longer worry if I am missing something important because my skills are not at the appropriate level. Overall I feel that this confidence has made me a better doctor. Without the wide range of problems that are encountered at this institution, I do not know if my comfort level would have had a chance to reach the level that it has.